Fond festive memories of Christmas ’97’s gleeful kart, hovercraft and plane adventure: Diddy Kong Racing. Leon, Darren, Karl and our community peer through a haze of Nintendo 64 fuzz to Rare’s candy cane (and rinse) fuelled sugar rush. Darren Gargette has a good old nostalgic explore of Rare’s beloved N64 classic Diddy Kong Racing from Christmas 1997. Darren is capturing the game via PC emulation here. 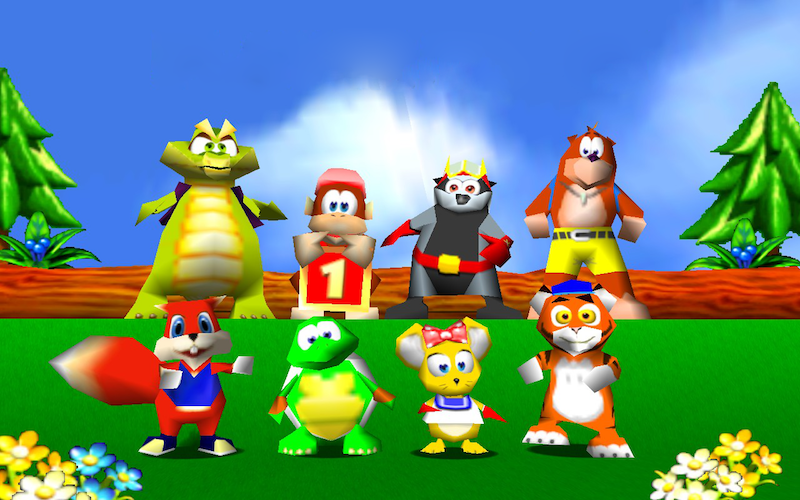 Darren emulates the 2007 DS version of Diddy Kong Racing on PC, but laments the loss of the charm of the 1997 N64 perfect Christmas present original. The thing about the game’s characters is that, even at the time, it felt to me like Rare were overdoing the generic cutesiness on purpose, with Pipsy being the culmination. It’s almost satire. The greatest indicator is the stock film sound of children’s laughter when the logos appeared pre-opening. You’ll often hear that same sound being used in a creepy context, i.e. spooky scenes in children shows or even horror movies. I’m pretty sure you’re right that there probably was an element of knowingness to characters like Pipsy, Timber et al. I hadn’t made the connection between the kiddy laughter and creepiness in this particular game before though. I seem to recall that ShadowMan (another title that made its debut on N64) had a level which used that to great effect however!